The Winegrape Inspection Program provides a professional, consistent, and impartial inspection service to the wine industry of California. WIP provides a consistently uniform service that makes determinations and certification of soluble solids, Material Other than Grapes (MOG) and defects in the loads of grapes. The program hires, trains and supervises as many employees as necessary to adequately carry out the request for inspection. The program emphasizes that uniformity in the application and procedures for grading and testing are identical at all inspection stations. The only purpose is to professionally and impartially inspect wine grapes as instructed and governed in the regulations. The Winegrape Inspection Program operates under the authority of the California Winegrape Inspection Advisory Board, which is composed of ten vintner members and ten grower members, each of which has an alternate member, and all of which are appointed by the California Department of Food and Agriculture. The Advisory Board meets two or three times a year to establish an annual budget, set an assessment rate (paid half and half by the wineries and the growers), and decide upon any research programs that might improve the program’s ability to do the assigned work involved: i.e., the inspection of winegrapes as they enter the signatory wineries. Because the Advisory Board is an arm of the Secretary of Food and Agriculture, its actions must be approved by the Department, which assigns a representative from its Marketing Branch to oversee the actions of the Board. The Winegrape Inspection Marketing Agreement is the official title of the program that is operated by the Advisory Board under the supervision of the Marketing Branch of the Department of Food and Agriculture. It is called a marketing agreement, rather than a marketing order, because only those wineries that have agreed to abide by the Agreement are subject to the assessments imposed by the Board. Further, only those growers who sell their grapes to the signatory wineries are eligible to serve on the Advisory Board. The Advisory Board is headquartered in Dinuba, California, where it is managed under contract by Monfort Management Services with Jerry Munson named as manager and J D Allen as Assistant Manager. The Dinuba office is responsible for the collection of the assessments, the payment of the Board’s bills, the oversight of the inspection operations, and the maintenance of the Board’s records. In 1939, leaders of the industry realized there was a need to guarantee the level of sugar in grapes delivered for processing. Legislation was passed, making third party inspection mandatory on all loads of grapes where the purchase price is based on soluble solids content. In 1959, the first quality inspections to determine the amount of mold and decay in grapes were performed by hand sorting defective grape berries from representative samples. By 1971, the wine industry became aware that “Material Other than Grapes” (MOG) delivered in loads of grapes was detrimental to the making of quality wine. The Wine Institute funded necessary research to establish “foreign material” inspection procedures and the Program began inspecting and certifying the pounds per ton and percentage of MOG in loads. On April 30th, 2005 the CDFA issued the “California Winegrape Inspection Marketing Agreement”. 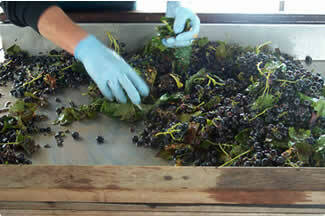 The Winegrape Inspection Advisory Board was established to assist the Department in administering the Program. Each year the Board recommends the establishment of the inspection fees for the fiscal year. Both vintners and growers share the cost of inspection. The Winegrape Inspection Program provides extensive classroom and practical training for personnel in order to guarantee quality inspections and accurate certifications.